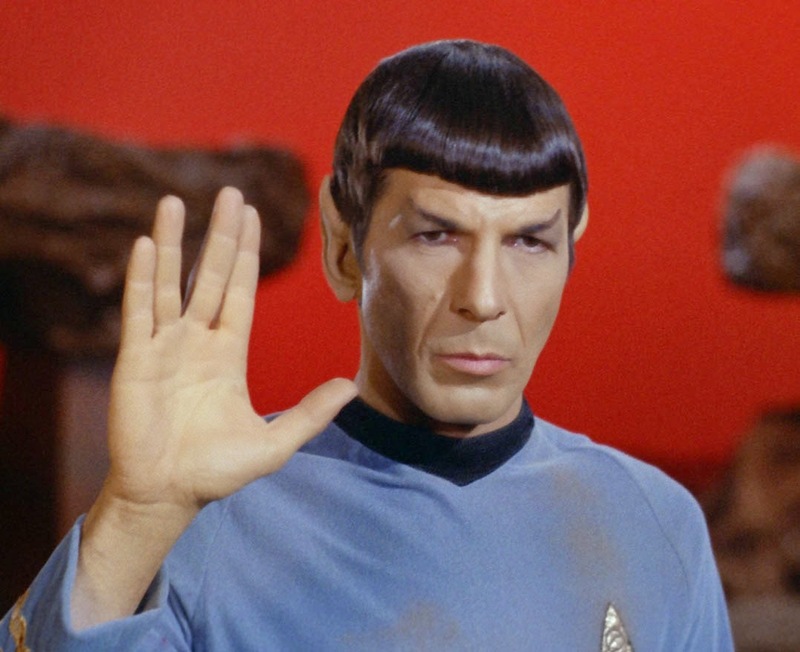 The geek community is mourning the death of Leonard Nimoy today, and we're no exception. Nimoy was an accomplished actor, director, writer and photographer, but he's best known for his legendary role as the human/Vulcan Starfleet officer Spock on the Star Trek franchise. He died today of end-stage chronic obstructive pulmonary disease at the age of 83. With his loss fresh in our minds, we thought it was time to review some of the greatest moments Nimoy brought us as Spock. In a parallel universe, Spock is as evil and ruthless as he is heroic and logical in ours. Yet Leonard Nimoy was able to portray the evil Spock, not as a mustache-twirling fiend, but as another side of the same character. It's a subtle distinction, but somehow Spock manages to be scary and menacing in this episode without becoming unrecognizable. It was a moment that Star Trek fans had dreamed of since the premiere of The Next Generation: the moment when the original series and the new series became one. In this episode, Spock returned as an older version of himself, and also showed another side to the formerly stereotypical evil Romulan Empire. In this episode, a plant's spores cause a state of bliss in anyone infected by them. Spock has a very different reaction to them, and we're allowed to see a rare glimpse of the emotional side of the Vulcan science officer. One of the great things about Spock is that he can be funny as well as admirable. Spock was occasionally stuffy enough that we enjoyed seeing him taken down a peg. This episode is a fan favorite for its comedic elements, and when Spock declares his immunity to the appeal of the Tribbles, it's definitely one of his funniest moments. This episode is a showcase for Spock in that it shows two sides of him: a rebellious side when he hijacks the Enterprise to take them to a forbidden planet, and also flashback clips from the unaired pilot, the true first appearance of Spock. It's an extraordinary glimpse into the genesis of the character and the complexity of Spock, all in one episode. Say what you will about the reboot, but the return of Spock in the new Star Trek movie warmed the hearts of both opponents and fans of the new film. It showed how Leonard Nimoy personified the franchise, how beloved he is, and how Zachary Quinto couldn't hold a candle to him. In this classic episode of the original series, when Kirk discovers his true love has to die to save the future, it's Kirk who seems to have the best moments, struggling with the consequences of his actions. But Spock serves as the perfect guide for Kirk, weighing his sympathy with firm logic and conviction. For any other actor, having to get down on his knees and overact to a guy hiding under a rug would have been downright ridiculous. But Leonard Nimoy used his acting skills to make the scene not only believable, but deeply moving, an insight into a misunderstood creature. This entire episode was a triumph, allowing Leonard Nimoy a chance to show some rare emotion in the character of Spock while he struggled to contain his raging hormones. But the final fight between Kirk and Spock is epic. It was the moment that broke a million geek hearts, the death of the beloved Spock. Even though his death proved to be short-lived, the final scene still resonates, especially in the wake of Nimoy's real-life death. What was your favorite Spock moment? 8 Interesting Facts About Spock's Return on "Unification"
Awesome list, I thought of all ten of those... as I read I knew each one and hold each in my heart as the greater moments in his life... LLAP! Truly great tribute guys, its hard to believe the great vulcan is gone. This is a wonderful tribute. I was sad about his passing. Thanks guys. That's all I have to say.